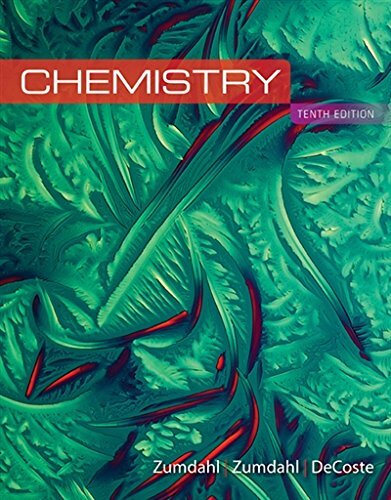 1305957407 -The tenth edition of Steve and Susan Zumdahl’s widely regarded CHEMISTRY combines a robust conceptual framework, a readable and engaging writing style, and an unparalleled selection of problems and exercises that make it one of the most trusted chemistry textbooks available today. CHEMISTRY uses a thoughtful approach built on creative problem-solving techniques and critical thinking. An emphasis on modeling and interactive examples helps students learn how to approach and solve chemical problems — to think like chemists — so that they can apply the process of problem solving to all aspects of their lives. Zumdahl and Zumdahl — and new coauthor Don DeCoste — give students the tools they need to become critical thinkers: solve problems, apply chemical theories, and evaluate outcomes.